The Pastoral Epistles were given significant attention at this year’s Annual Meeting of the Evangelical Theological Society. First, we had an excellent session in the Pastoral Epistles Group. Chuck Bumgardner began our session with a paper titled, “Kinship, Fictive Kinship, and the Letters to Timothy and Titus.” Bumgardner compared what these letters say about family relationships and relationships within the body of Christ (Bumgardner used the phrase “fictive kinship” because it is the standard phrase used to refer to social relationships which are seen or described as familial though there is no blood relation ). He argued that Paul’s use of such language in the PE is not incompatible with his use of it in his other letters, and it does not necessarily indicate that the church is moving from an egalitarian stage to a hierarchical one. His paper also provided an initial sounding of the intersection between Christian family and social family roles in the PE, suggesting that Paul navigates such intersections with a missionary concern for outsiders. Dillon Thornton was snowed in and, therefore, unable to attend. However, he emailed me his paper, and I was able to read it. The paper,“’Saying What They Should Not Say’: Reassessing the Gravity of the Problem of the Younger Widows (1 Tim 5:9-16),” argued that the younger widows were aligned with the false teachers. Paul’s instruction left them three possibilities: 1) to remain with the false teachers and thus under judgment, 2) to marry unbelievers, thus parting ways with the false teachers (who forbid marriage), and still remaining under judgment, or 3) to remarry in the faith, thus parting ways with the false teachers and realigning with the Pauline church. This answers some of the knotty issues of this passage and gives more attention to many of the specifics than I have seen elsewhere. Greg Couser’s paper, “The Church as Family: The Nature of the Household of God in 1 Timothy,” argued that the relationships within the church are not merely “fictive” but are in fact more real than blood relations, as Jesus himself said (Matt 12:46-49). Couser provided a robust argument that the ethics of 1 Timothy are not based in cultural accommodation but in the gospel itself. This is a crucial point for understanding the PE since their ethics are so often dismissed or overturned because they are seen as culturally bound. ​Peter Walker closed the session with his paper, “1 Timothy & Titus Relocated: Reimagining the Connections.”​ Walker argued for placing the PE within the framework of the book of Acts. He has made this argument in print previously, but in this paper he discussed implications of this view including connections between these letters and 1-2 Corinthians and Romans. He also argued this would remove several common critiques of the PE. While, in the end, I was not convinced, Walker made many good challenging points which helped me think more clearly about the dating of the letters. In addition to our session, several other papers related to the Pastorals were presented. Thanks to Chuck Bumgardner for gathering this list. Jamin Hübner (John Witherspoon College) “The Evolution of Complementarian Exegesis” (This is equivalent to Jamin Hübner, “The Evolution of Complementarian Exegesis,” Priscilla Papers 29/1 (Winter 2015), 11-13. Reviewers: Lynn Cohick (Wheaton College); E. Randolph Richards (Palm Beach Atlantic University); Karelynne Ayayo (Palm Beach Atlantic University); F. Alan Tomlinson (Midwestern Baptist Theological Seminary). In the third volume of Craig Keener’s massive Acts commentary, he has a long excursus on the relationship between Acts and the Pastorals (pp. 3023-3026). Probably the most significant part of the excursus is the thorough chart listing the itineraries (people, places and events) of the Pastorals, Acts and the earlier Pauline letters side by side. This is very helpful. In the end, Keener is convinced of a second imprisonment for Paul which is described in 2 Timothy- the traditional explanation. The draft of the program for the annual meeting of ETS has just been released. Here is the program for our Pastoral Epistles group. I hope a number of you will join us. We have just added one more item to the 2014 publications post. Thanks to Chuck Bumgardner for locating the item and passing it along. Fred Sanders, well known for his work on the Trinity, has been recently working with the Pastoral Epistles and his post, “Moral Beauty in the Pastoral Epistles,” is well worth reading. He reflects on Chapter 5 of Ceslaus Spicq’s 1963 The Trinity and our Moral Life, a book which I must confess I have not read. Sanders notes how richly Spicq draws from the the Pastorals in his discussion of the beauty of the moral life and suggests this ethical discussion may be part of the reason for the distinct vocabulary of the Pastorals. This is the gospel expressed not just with the change of a few words into a more hellenistic moral vocabulary, but in a way that actually lays hold of and commandeers what is best in that ancient pagan tradition. The unique vocabulary that Paul used in these letters to his deputies, the half-gentile Timothy and the fully-gentile Titus, is a bold missionary appropriation of Greek ethics. In the previous post about the meeting of the Pastoral Epistles Study Group at ETS I mentioned that David Pao’s paper was scheduled for publication in JETS. 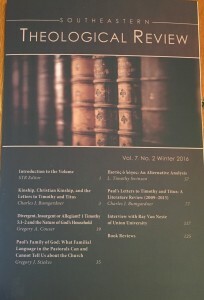 My copy of the December 2014 (57:4) issue of JETS just arrived, and Pao’s article, “Let No One Despise Your Youth: Church and World in the Pastoral Epistles” is on pages 743-55. It is well worth reading.